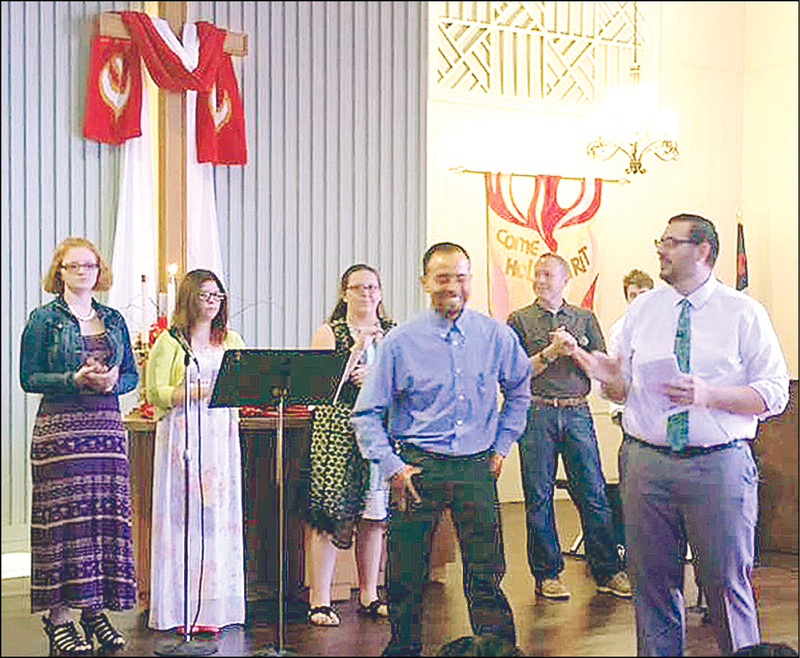 The two United Methodist congregations in Heavener — one English-speaking and one majority Hispanic — have built a bridge between one another and formed a new church. They chose a new name, too. Faithbridge United Methodist Congregation held its first joint service Sept. 11 in the building that housed the former First UMC. Faithbridge will continue to meet there. About 100 people attended that first service. The merger has been a blessing, said Pastor Tim Boyer. "Both (congregations) have accepted it with love and accepted each other with love." On Sundays, two worship services are offered, with the choice of Spanish or English. The Spanish-language service is led by Associate Pastor Castulo Garcia and meets in the church’s fellowship hall. Worship in English is held at the same time in the sanctuary, with Rev. Boyer preaching. Faithbridge’s leaders are convinced that children are the key to a successful merger, so there is one "children’s church" ministry. Children are "together in school. We wanted them to be together in church," Boyer said. "That’s a big priority." Leaders believe the merged congregation also will be stronger in other ways, said Larry Bauman, superintendent of the Lake Country District. Previously the Hispanic congregation had been meeting in an aging, former Presbyterian Church facility and needed better space, and the Anglo congregation needed an infusion of energy. "The challenge is always building understanding between different cultures," especially when they don’t share a common first language, Rev. Bauman said. Once a month there is a bilingual service, on Communion Sunday. For that time, songs are in Spanish and English and the words are projected in both languages. Boyer gives a "short meditation" instead of a full sermon, he said. That Sunday, the congregations also collaborate in a meal featuring Mexican and American foods. This month, the church plans to introduce wireless translating equipment, Boyer said. In the English-language service, worshippers using the headsets will hear Spanish translation. In keeping with its dual-culture theme, Boyer hopes Faithbridge soon will offer classes in Spanish and in English for second-language learners. The word Congregation is part of the name because its definition is "a group of people assembled together. It helps identify that we are a people assembled together for Jesus Christ; more than just a building, but a connected group," Boyer said. A Local Pastor, he was formerly a youth director at Ponca City-St. Paul’s UMC. He began preaching at Heavener in 2014. He values highly several books he read before September’s official merger. He is pleased with Faithbridge’s early results. "We have reached new people. We find that to be exciting. Being in a multicultural church is exciting!" Superintendent Bauman said the English-speaking worshippers number about 70, and about 30 people attend the Spanish service at this time. Carlos Ramirez, a previous pastor at Heavener, attended the first joint service. "We are all one in Christ. What better way to show it?" he said. Members of the new Faithbridge United Methodist Congregation celebrate on their first day of services, Sept. 11, in Heavener.